The prime minister said there was a time when the going notion (“soch”) was that ‘Bharat badal nahi sakata’ (India can never change). “I have changed that very notion” he added. Prime minister Narendra Modi on Tuesday attacked the Congress for corruption and slammed the party for its inability to plug the leakages despite knowing where the problem lay. Without naming Rajiv Gandhi, he said a former prime minister had acknowledged that only 15 paise of the Re 1 meant for development work reached the villages or the beneficiaries. The remaining 85 paise just disappeared. Modi said the party (read Congress) had ruled the country for many years. It was lamentable that 10-15 years after its leader acknowledged the prevailing corruption; the party was unable to plug the leakages. The party knew about the disease but it had no treatment for the same. It also lacked the political will or the determination required to put an end to this kind of loot, he said. Modi added, during its four-and-half years in power, his government had taken measures through the use of technology to plug the leakages. As a consequence of this cent per cent of the funds reached the beneficiaries. Citing figures he said around Rs 5,80,000 crore or 80 billion dollars were transferred directly into the bank accounts of people either by way of gas subsidy, education, grain etc. He queried what if the country was administered in accordance with the older system? In such a scenario Rs 4,50,000 crore would have disappeared in leakages. The prime minister said there was a time when the going notion (“soch”) was that ‘Bharat badal nahi sakata’ (India can never change). “I have changed that very notion” he added. India today is emerging as a formidable economic power and is also progressing fast in the sports arena. The youth of the country under the ~Make in India banner was manufacturing mobile phones, trucks, trains etc. 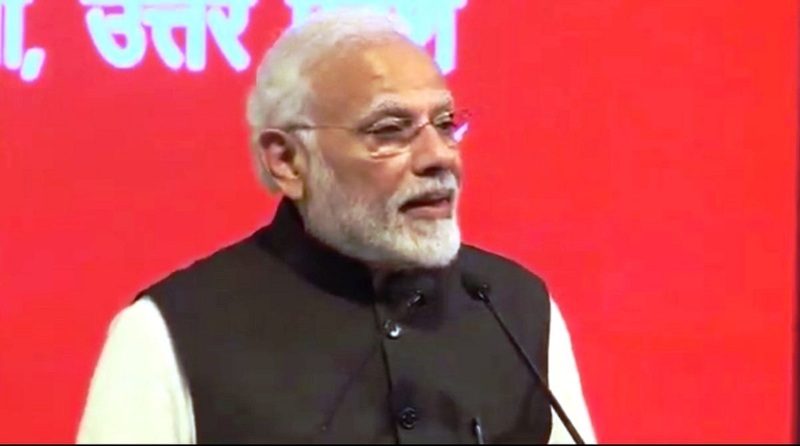 Speaking at his parliamentary constituency of Varanasi, at an event to mark the Pravasi Bhartiya Diwas, the PM also listed another achievement of his government which was aimed at ending corruption. He said the names of seven crore fake (“farzi”) beneficiaries of government schemes had been struck off. These people existed only on paper but were getting the government benefits. Modi enumerated the steps taken by his government to help the NRIs. He asked them to encourage at least five families to travel to India. This would give a fillip to the tourism sector, the Prime Minister said, adding that the country is also celebrating the 150th birth anniversary of Mahatma Gandhi. The Prime Minister lauded the NRIs as India’s brand ambassadors.